Since 1994, Callahan’s Karate has been proud to offer an award-winning Kenpo Karate program to the Bedford community. 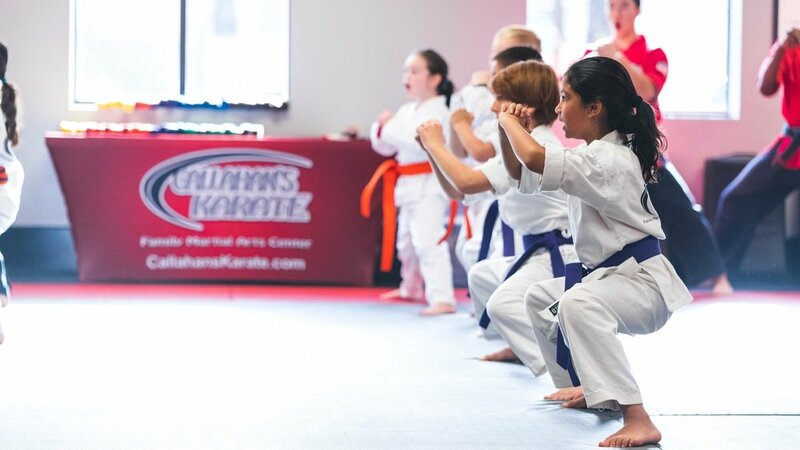 Our comprehensive training curriculum includes traditional martial arts and self-defense with a strong focus on personal fitness, physical empowerment and positive character development for all ages and abilities. Our modern 10,000 square foot center located in the heart of Bedford is home to hundreds of students who enjoy our highly professional, welcoming and family friendly atmosphere. Our exceptional team of trained instructors, led by Richard and Winnie Callahan, create a positive environment to help all students succeed in all aspects of their training. Our students have seen great results as they grow with martial arts. The principles we teach here help them build confidence and discipline in all aspects of their lives. Creating the foundation for Confidence, Self-Control and Respect in a fun and supportive environment. Developing self defense and life skills to help manage stress, improve confidence, self discipline and achieve goals. Encouraging physical fitness and personal development while studying practical and effective self defense. one of the LARGEST and most MODERN Karate studios.